Neat! I wish I have the skills to do this, love it! The problem is with the ground wire. It has to be ground to the same circuit. This problem is all over other boards. What people are doing is using the dome pos and neg. Try this with the foot wells. I was gonna ask you just the other day if using the ground were you had it was working. Preciate the response chXFS! I'll reground them to the foot wells this wknd while I'm helping my buddy install some on his Mercedes, which has a light in the door so his install should be quick and easy. So I already have the logo with the circle around it. I found a company that will custom make the ghost light with just the logo and no ring around it. The price is $69. I'd like to see what other peoples opinions are with or without the circle. I prefer the ring but I guess that opinion is one-sided since I haven't seen it without the ring. I saw somewhere that a guy had them on his Range Rover (I think it was) and it projected the image of the vehicle with no circle and I didn't really care for it. I guess to give a fair assessment I'd have to see the Jag ones without the ring. The Evoke loaner I had just had the vehicle shape. You might have been who I was thinking of when I mentioned the Range Rover....did you ever post a pic of the Evoke ghost light? You were absolutely correct. I finally got around to messing with theses things today and grounded them to the footwell lights, where I'm getting the power from and they work as intended. I think I'm going to have to order another set however because the constant burning has made them wash out some. They're no longer as bright I don't think and the red lettering now just looks white. 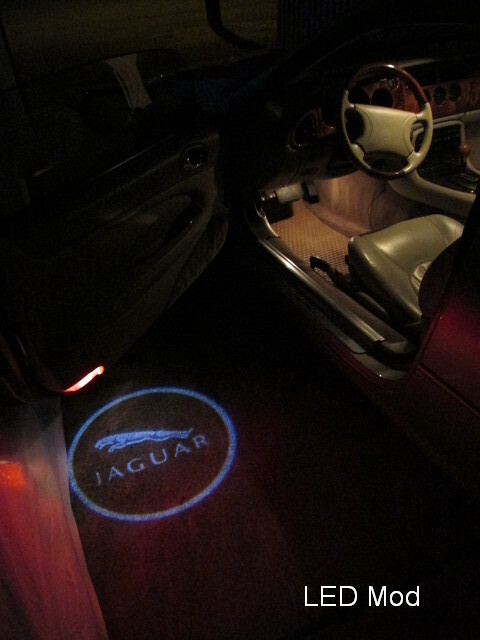 The installation of these lights on an XK8 was simple as the car is already equipped with lights in the door. But, the results speak for themselves. Last edited by bradstuff; 09-03-2014 at 10:38 PM. It looks GREAT. Good job RodTee. Now I have no excuse but to tackle mine. I might need extra help so please be on standby. It's a t10 194 the same as you would use in the interior. Last edited by chXFS; 11-20-2014 at 01:19 PM. 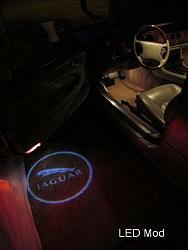 I'd like to install these on a '96 XJ6 VP..the doors have the stock puddle lights...has anyone done this? It would be nice if there was a replacement/retro fit for the existing red lenses..any tips? It was a lousy work day!